Little Dragon's first release was the double A-side 7" single "Twice"/"Test", released on the Off the Wall label in 2006. The following year, the band signed with the larger British independent label Peacefrog Records and released their eponymous debut album in August 2007. Their second album, Machine Dreams, was released in August 2009, and gathered favourable reviews. The third album, Ritual Union, was released in July 2011 and was ranked at number 41 on Rolling Stone list of the 50 Best Albums of 2011. Clash placed it at number 31 on its list of The Top 40 Albums of 2011. Little Dragon formed in 1996 in Gothenburg, Sweden. Yukimi Nagano was in her first year in high school when she met seniors Fredrik Wallin and Erik Bodin. The three of them would meet up after school to jam and play records by De La Soul, A Tribe Called Quest and Alice Coltrane. The band's name was inspired by the "Little Dragon" nickname Nagano earned due to the "fuming tantrums" she used to throw while recording in the studio. "It's a little exaggerated but there is some truth in it", Nagano said. "But we've grown up a bit and I realised you can't have a fit every day because otherwise you won't be able to stand each other." 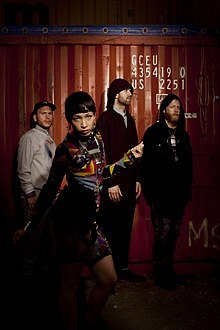 Little Dragon has toured throughout Europe and has also made music videos for the songs "Test", "Twice", "Constant Surprises", "After the Rain" and "Fortune". The video for "Twice" was directed by award-winning Swedish filmmaker Johannes Nyholm. The double A-side single "Fortune"/"Blinking Pigs" was released in the UK on 26 January 2009. The band's song "Twice" has been featured in the television shows Grey's Anatomy, 90210, Revenge, The Vampire Diaries, and Being Mary Jane, as well as in the 2010 independent drama film I Will Follow (which also features the band's song "Scribbled Paper") and the 2013 psychological thriller film Magic Magic. Little Dragon was chosen as one of Beyond Race Magazine's "50 Emerging Artists" in late 2009, resulting in a spot in the publication's 11th issue as well as an exclusive online Q&A on the magazine's site. On the recommendation of his wife, Damon Albarn invited Nagano and her bandmates to feature on Gorillaz's 2010 album Plastic Beach, appearing on the tracks "Empire Ants" and "To Binge". Albarn then asked Little Dragon to join Gorillaz on their Escape to Plastic Beach Tour. In September 2011, former keyboardist Arild Werling rejoined the group on support keys during live performances. Little Dragon's fourth studio album, Nabuma Rubberband, was released on 12 May 2014 in the United Kingdom via Because Music and on 13 May in the United States via Loma Vista Recordings. The album was inspired by Janet Jackson's slow jams. "Klapp Klapp" was released as the album's lead single. The second single, "Paris", debuted on Zane Lowe's BBC Radio 1 programme on 8 April 2014. Nabuma Rubberband received a nomination for Best Dance/Electronic Album at the 57th Annual Grammy Awards. The band's fifth studio album, Season High, was released on 14 April 2017 by Loma Vista Recordings. It has spawned the singles "High" and "Sweet". ^ "Little Dragon, 'Nabuma Rubberband' (May 13th) – Spring Music Preview 2014: 27 Must-Hear Albums". Rolling Stone. 3 March 2014. Retrieved 17 May 2015. ^ "Happening Monday: Little Dragon, Adele and more". Los Angeles Times. 15 August 2011. Retrieved 17 May 2015. ^ a b Newman, Jason (14 February 2014). "Little Dragon Return With New Album 'Nabuma Rubberband'". Rolling Stone. Retrieved 21 June 2014. ^ a b Vick, Megan (29 December 2010). "Little Dragon Preps New Album After Gorillaz Tour". Billboard. Retrieved 21 June 2014. ^ Weiss, Sam (3 October 2012). "Little Dragon Responds to Dropped Big Boi Collaboration". Complex. Retrieved 17 May 2015. ^ Murphy, Kilian (3 September 2007). "Little Dragon". Hot Press. Retrieved 17 May 2015. ^ Bachor, Ken (10 August 2011). "10 Must-Hear Artists at Outside Lands Fest: Little Dragon". Spin. Retrieved 17 May 2015. ^ a b c "Peacefrog : Artists : Little Dragon". Peacefrog Records. Retrieved 28 July 2011. ^ "50 Best Albums of 2011: Little Dragon, 'Ritual Union'". Rolling Stone. 7 December 2011. Retrieved 13 July 2016. ^ "The Top 40 Albums Of 2011: 40 – 31". Clash. 2 December 2011. Retrieved 13 July 2016. ^ a b c Rathe, Adam (11 April 2011). "The Rise of Little Dragon". Spin. Retrieved 16 April 2011. The band formed 15 years ago in Gothenburg, Sweden. ^ Purdie, Ross (20 July 2011). "Little Dragon happy getting big". Nine News. Archived from the original on 21 July 2011. Retrieved 28 July 2011. ^ "An Honest Mistake". Grey's Anatomy. Season 5. Episode 16. 19 February 2009. ABC. ^ "90210 Music | Season 3 – Episode 6". The CW. Archived from the original on 20 January 2012. Retrieved 21 June 2014. ^ "Revenge ABC TV Show Music & Songs". ABC. Retrieved 21 June 2014. ^ "Growing Pains". The Vampire Diaries. Season 4. Episode 1. 11 October 2012. The CW. ^ "Girls Night In". Being Mary Jane. Season 1. Episode 2. 14 January 2014. BET. ^ Gao, Boyuan (2009). "Little Dragon". Beyond Race Magazine. Archived from the original on 22 February 2010. Retrieved 22 February 2010. ^ "Is the Little Dragon set to grow a fifth limb?". Little Dragon News. 19 September 2011. Retrieved 3 October 2011. ^ a b Pelly, Jenn (13 February 2014). "Little Dragon Announce New Album Nabuma Rubberband, Share Single "Klapp Klapp"". Pitchfork. Retrieved 21 June 2014. ^ Gordon, Jeremy (8 April 2014). "Little Dragon Debut New Song "Paris"". Pitchfork. Retrieved 21 June 2014. ^ "Grammys 2015: Complete list of nominees". Los Angeles Times. 5 December 2014. Retrieved 9 July 2015. ^ a b Yoo, Noah (8 March 2017). "Little Dragon Announce New Album Season High, Share New "Sweet" Video: Watch". Pitchfork. Retrieved 11 March 2017. ^ "Nabuma Purple Rubberband". Adult Swim. Retrieved 13 July 2016. ^ "Twice Remix – EP by Little Dragon". iTunes Store (SE). Retrieved 21 June 2014. ^ "Blinking Pigs – EP by Little Dragon". iTunes Store (SE). Retrieved 21 June 2014. ^ "Ritual Union (Remixes) – EP by Little Dragon". iTunes Store (SE). Retrieved 6 July 2016. ^ "Little Man (Remixes) – EP by Little Dragon". iTunes Store (SE). Retrieved 6 July 2016. ^ "Amazon Artist Lounge: Little Dragon: MP3 Downloads". Amazon.co.uk. Retrieved 21 June 2014. ^ "Klapp Klapp / Paris Remixes - EP by Little Dragon". iTunes Store (SE). Retrieved 6 July 2016. ^ "Test"/"4ever" (7" single liner notes). Little Dragon. Off the Wall Records. 2006. OTW001. ^ "Twice – Single by Little Dragon". iTunes Store (SE). Retrieved 21 June 2014. ^ "Constant Suprises – Single by Little Dragon". iTunes Store (SE). Retrieved 21 June 2014. ^ "Recommendation – Single by Little Dragon". iTunes Store (SE). Retrieved 21 June 2014. ^ "Fortune/Blinking Pigs". Amazon.co.uk. Retrieved 21 June 2014. ^ "Feather (Radio Edit) by Little Dragon". iTunes Store (SE). Retrieved 21 June 2014. ^ "My Step by Little Dragon". iTunes Store (SE). Retrieved 21 June 2014. ^ "Runabout by Little Dragon". iTunes Store (SE). Retrieved 21 June 2014. ^ "NightLite by Little Dragon". 7digital (US). Retrieved 21 June 2014. ^ "Ritual Union – EP by Little Dragon". iTunes Store (SE). Retrieved 21 June 2014. ^ "Little Man (Remixes) – EP by Little Dragon". iTunes Store (SE). Retrieved 21 June 2014. ^ "Sunshine – Single by Little Dragon". iTunes Store (SE). Retrieved 21 June 2014. ^ "Klapp Klapp – Single by Little Dragon". iTunes Store (SE). Retrieved 21 June 2014. ^ "Paris: Little Dragon: MP3 Downloads". Amazon.co.uk. Retrieved 21 June 2014. ^ "Let Go : Little Dragon: MP3 Downloads". Amazon.co.uk. Retrieved 21 June 2014. ^ "High – Single by Little Dragon". iTunes Store (SE). Retrieved 11 March 2017. ^ "Plastic Beach by Gorillaz". iTunes Store (AU). Retrieved 7 May 2017. ^ "Wildfire (feat. Little Dragon) – Single by SBTRKT". iTunes Store (SE). Retrieved 21 June 2014. ^ "Scale It Back by DJ Shadow". iTunes Store (GB). Retrieved 21 June 2014. ^ "Light (feat. Little Dragon) – Single by ODESZA". iTunes Store (SE). Retrieved 11 March 2017. ^ "Minerva (feat. Little Dragon) – EP by Billion One". iTunes Store (SE). Retrieved 11 March 2017. ^ "Little Dragon – Twice (2007)". IMVDb. Retrieved 21 June 2014. ^ "Little Dragon – Test". YouTube. Retrieved 7 July 2016. ^ "Little Dragon – Constant Surprises (2008)". IMVDb. Retrieved 21 June 2014. ^ "Little Dragon – Fortune". YouTube. Retrieved 7 July 2016. ^ Knight, David (2 September 2009). "Little Dragon's Swimming by Yusuke Nagano". Promo News. Retrieved 21 June 2014. ^ "Little Dragon – After the Rain (2008)". IMVDb. Retrieved 21 June 2014. ^ "Video: Little Dragon "Never Never"". Okayplayer. 7 January 2010. Retrieved 21 June 2014. ^ "Little Dragon – "My Step" (video)". Exclaim!. 14 January 2011. Retrieved 21 June 2014. ^ Samuel, Kiran (8 September 2011). "Video: Little Dragon, "Brush The Heat"". The Fader. Retrieved 21 June 2014. ^ "Little Dragon – Brush the Heat (AVA remix) (2011)". IMVDb. Retrieved 21 June 2014. ^ Knight, David (12 March 2012). "Little Dragon 'Crystalfilm' by Daniel Wirtberg". Promo News. Retrieved 21 June 2014. ^ "Little Dragon – Sunshine (2012)". IMVDb. Retrieved 21 June 2014. ^ Pelly, Jenn (14 February 2014). "Video: Little Dragon: "Klapp Klapp"". Pitchfork. Retrieved 21 June 2014. ^ Murray, Robin (2 May 2014). "Little Dragon – Paris". Clash. Retrieved 21 June 2014. ^ Gordon, Jeremy (2 July 2014). "Little Dragon Share "Pretty Girls" Video". Pitchfork. Retrieved 13 July 2014. ^ Gordon, Jeremy (6 November 2014). "Little Dragon Share "Underbart" Video". Pitchfork. Retrieved 12 February 2015. ^ "Little Dragon "Mirror"". YouTube. 11 August 2015. Retrieved 29 February 2016. ^ Gaca, Anna (14 February 2017). "New Music: Little Dragon – "High"". Spin. Retrieved 11 March 2017.